The 40th Anniversary celebrations will continue on the South Devon Railway over the August Bank Holiday weekend, 29th to 31st August 2009, when the railway hosts its Rails and Ales gala event. Running from the Saturday through until Bank Holiday Monday, the event will see no fewer than seven locomotives in use. 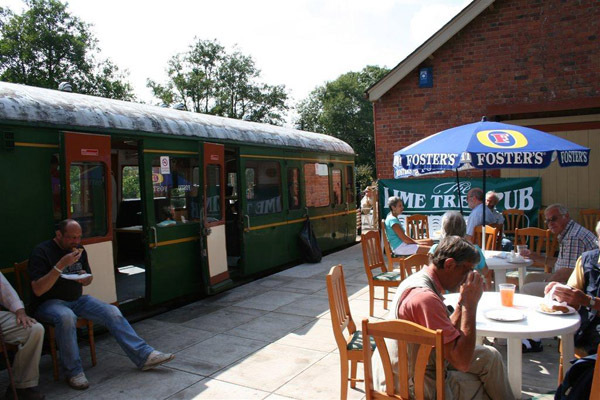 A special train service will be in operation on all three days, with extra trains running between Buckfastleigh and Staverton to connect into the Real Ale Festival being held at this idyllic former Great Western Railway country branch line station. The Saturday will see a mix of steam and diesel traction hauling passenger trains along the branch. "Small Prairie" 5526 will be in use working a number of auto trains, which will be formed of just a single trailer car. In the morning the auto train makes one round trip between Buckfastleigh and Totnes, including calling at Nappers Halt. The main chocolate and cream set will be hauled by former Great Western Railway "Heavy Freight" locomotive 3803, whilst the 1950's Carmine & Cream liveried set will be hauled by both English Electric Type 3 D6737 and former Great Western "pannier tank" 5786, which has recently been returned to its 1950's black livery. On the Saturday evening a special "Pie and Mash" train will depart from Buckfastleigh at 19.00. During the trip to Totnes passengers will be served with a pie and mash supper, whilst on the return run the train will make an extended stop at Staverton for passengers to sample the various ales and ciders on offer at the Real Ale Festival. Further details of this train, and how to book, will be available shortly from the main office at Buckfastleigh. On Sunday and Monday 5526 will again be used to work auto services, with 3803 and 5786 working the remaining steam hauled services. 1369 will be in steam at Buckfastleigh and will undertake station pilot duties, and recalling the scenes at many stations and yards of yesteryear it will be coupled to the former Great Western Railway shunters truck. A special freight train will operate between Staverton and Buckfastleigh on the Sunday and 1369 will be used to shunt the wagons from this train. The freight train returns back to Staverton on the Monday evening. There will be one diesel hauled passenger service on both days and this will be in the charge of Sulzer Type 2 D7612. On the Monday evening D6737 will attach to D7612 at Staverton, the final train being double-headed by the two green diesels. On both Sunday and Monday there will also be the rare chance to enjoy a trip behind the Devon Diesel Society's Class 04 diesel shunter, D2246. Although the little shunter has worked a few trains in the past, with only 204hp available it is not ideal for working trips over the full line, however on both days the little loco will be providing the motive power for brake van rides at Staverton. These will operate between the main trains and run from the station towards Buckfastleigh providing a round trip of about ¾ mile. Passengers will be accommodated in the former Great Western "Toad" brake van. All passenger trains have access and accommodation for wheelchairs, and all except the auto services have a buffet service. Staverton, a typical example of an idyllic Great Western country branch line station, is expected to be busier than ever over the three days as this will be the venue for the Real Ale Festival. Run by the Devon Diesel Society, together with the Staverton Preservation Group, the festival will be the sixth so far run at the station. The main bar will be located in the old goods shed adjacent to the main platform, and additional seating will be provided in a coach stabled in the dock platform. Due to popular demand there will be in excess of 25 different ales and ciders during the three-day event. With a variety of strengths and flavours on offer, there will be a drink to suit most tastes. Some of the local brews will be familiar to many, whilst others such as Well Blathered, Pressed Rat & Worthog, and BG Sips will be less so, coming from breweries whose ales are not regularly seen in Devon, and continue the tradition of giving some an unusual or quirky name. Also expected on sale will be Bulliver and Celebration Ale. Both are normally only available as bottled ales, and are brewed for the Society by Red Rock. "Bulliver Ale" is named after the branch train that once plied its trade between Totnes and the former branch terminus at Ashburton, whilst "Celebration Ale" has been produced to help mark the S.D.R's 40th anniversary since re-opening as a heritage railway. In addition to the cask ales, there will again be a range of traditional cider on sale, plus soft drinks. Due to the popularity at previous festivals the range has been increased to provide cider lovers with even more choice. There will be a range of snacks and other light refreshments. The Station group will also have a variety of hot pasties on sale. The Real Ale festival will help generate funding for the Devon Diesel Society's ongoing restoration work on its biggest locomotive, 117 ton Class 50 No. D402. Work is well underway to return this former express passenger locomotive to working order, with the locomotive being returned to as near built condition, and for Staverton Preservation Group to continue maintaining their delightful station. Over the weekend the Devon Diesel Society's other locomotives, Class 04 D2246 and Class 37 No. D6737 will be on show at Staverton during the festival. D2246 will be on display on Saturday, and D6737 on Sunday and Monday. With very limited parking at Staverton, visitors to the Real Ale Festival are being advised to use the frequent train services from both Totnes and Buckfastleigh. In addition to the above attractions, the Museum at Buckfastleigh will be open, as will the main workshop viewing gallery, whilst in the grounds at Buckfastleigh the miniature railway will also be operating. The heritage bus service linking Buckfastleigh station with Buckfast Abbey and Buckfastleigh Town will also be running. Expressway model and gift shop will be open selling a wide range of model railway items and other souvenirs, including a new all colour 144 page book by Don Bishop about the South Devon Railway. Working Timetables for downloading and local printing.